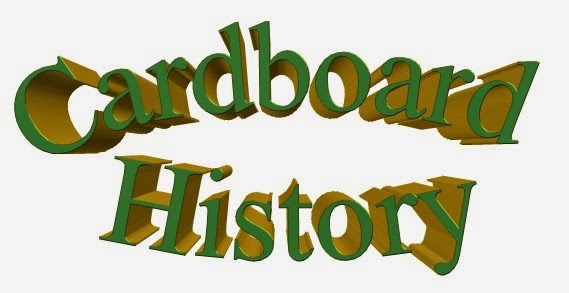 I've made a few trades in November, and they have brought me several hundred cards. It's weird, I go months without a single trade and then I get three in a week, and I am constantly surprised which cards people want. The sets I figure are the most common and will be the least wanted have been the most wanted. 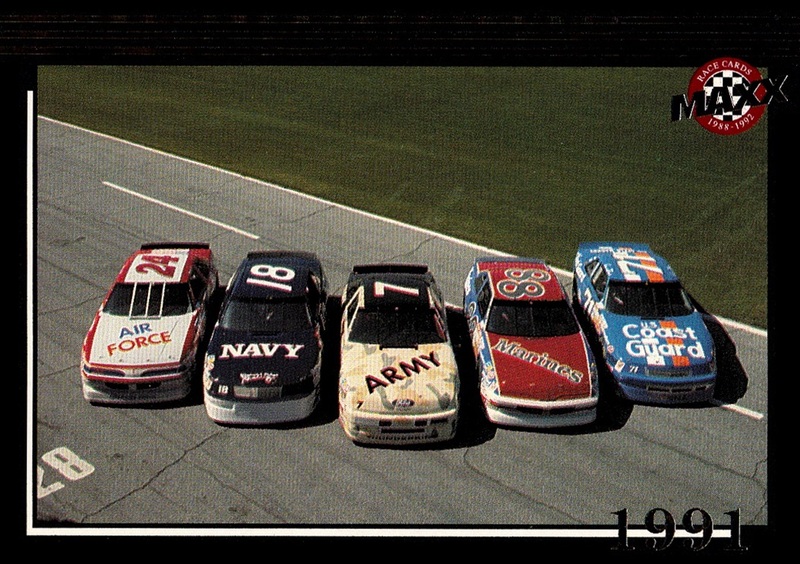 1991 Maxx, the most produced set in NASCAR history for example, I traded most away within a month of listing them on my tradelist on the Database. (You can buy a complete factory set for $5- or less!- on Ebay, any day of the week) But I am not complaining. Getting my duplicates into the hands of people who want them is something I love to do. 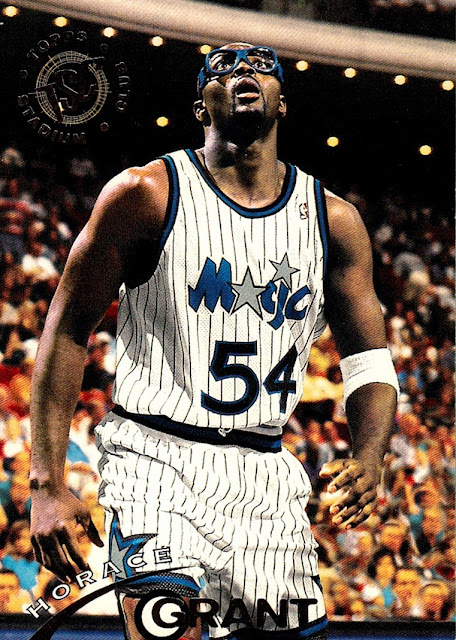 The first trade I made brought me more than 50 cards from 1992 Maxx 5th Anniversary, the black border set. This was also the first Maxx set to include foil. 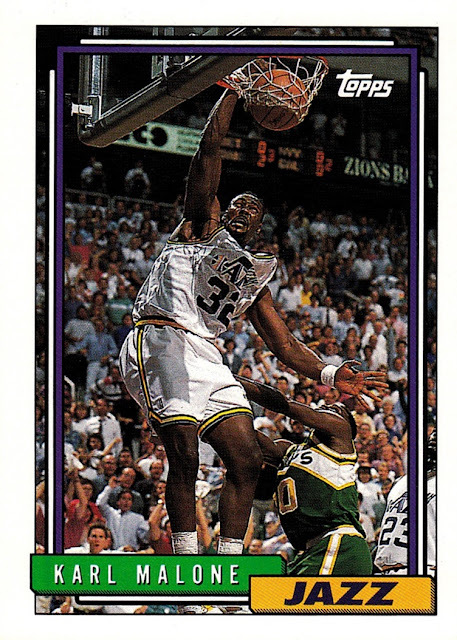 I am now only 1 card away from the complete 300 card set. I am missing Irv Hoerr. 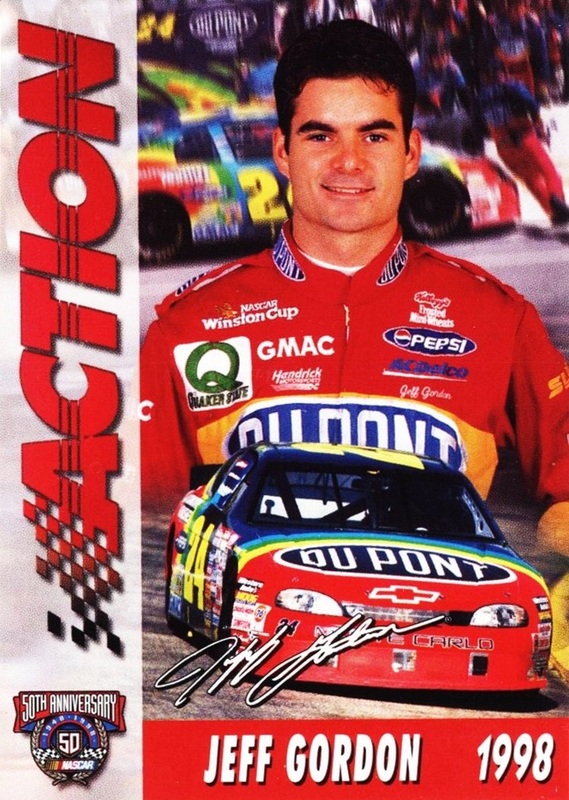 The standard, red bordered set was the first NASCAR set I ever completed, when I purchased a factory set in 1993. This is my favorite card of the 51 I got from the set in this trade. It's one of the Memorable Moments subset highlighting interesting events in the previous season. It's my favorite subset of all time, and Maxx did it until the end. (1996) It's the only one of the new additions I've scanned so far, most of them will be put off until later as they are already done on the Database. 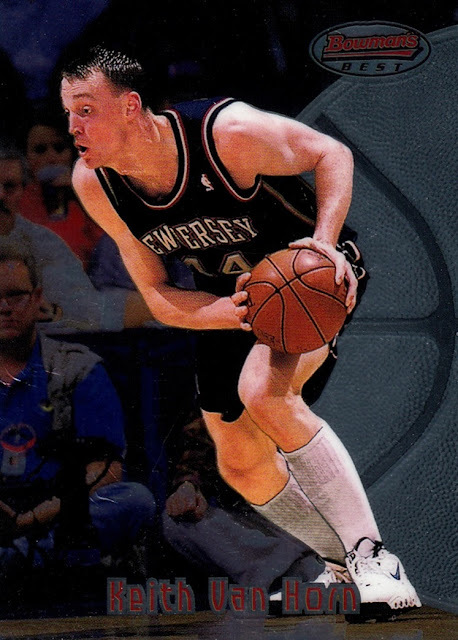 Another trade brought me nearly 120 cards, and got 1994-95 Stadium Club to only one card short of a complete set (Bill Wennington is the one missing). I got cards from a dozen different sets from this trading partner. 1994-95 Stadium Club is a 360 card set. Interestingly, although Stadium Club is one of my more favored brands, I've never completed any of them. This is now the closest I am to completing one. My third and final trading partner worked a little different trade with me- I didn't know what I was going to be getting from him. (I prefer not to know what I'm getting so I really enjoyed this). I got cards from more than a dozen sets, and one of them was new to my collection. 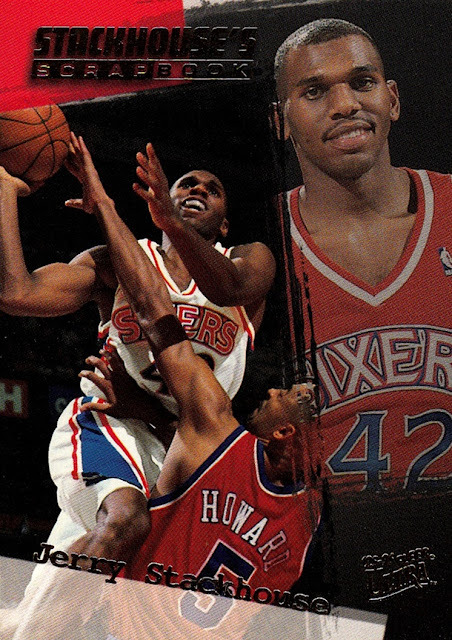 The most surprising to me was this 1995-96 Ultra Stackhouse's Scrapbook #S-3. I thought I had completed this set years ago, but I hadn't! 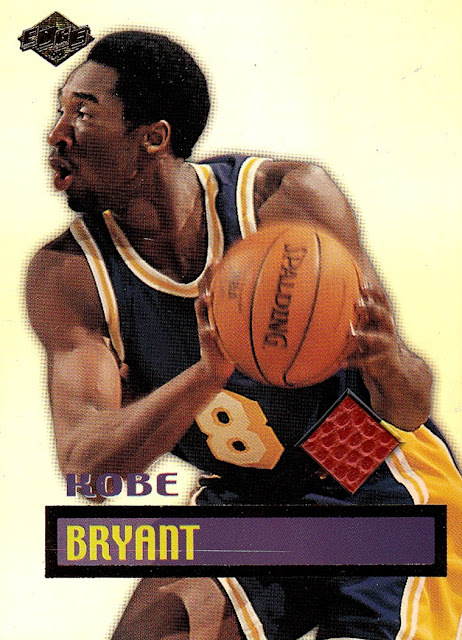 This was an interesting concept, in that this insert was issued, several cards at a time, in various Fleer products during 1995-96 and 1996-97. 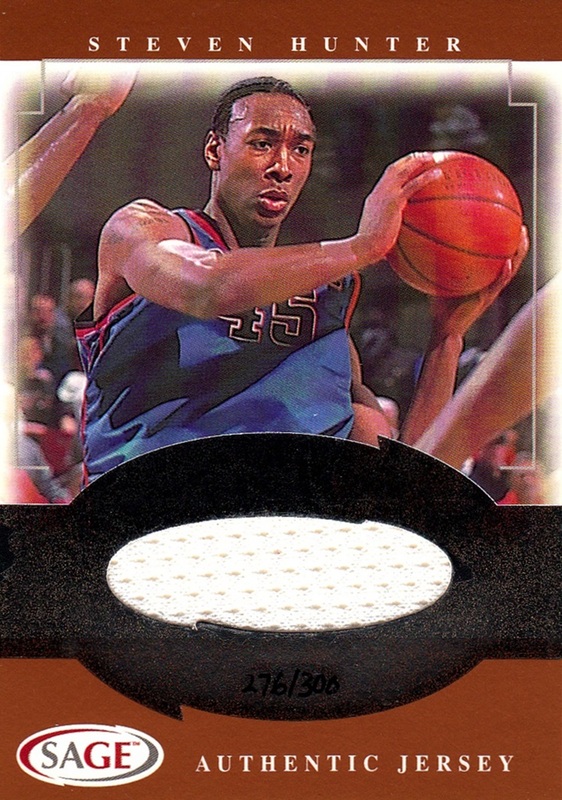 I'm not going to get it scanned in time, I want to get this post up in November, but two of my more favorite cards in this trade package were two of the 2012-13 Hoops Taco Bell promos. These look mostly just like regular 2012-13 Hoops cards but they have rounded corners and different text on back, as well as different numbers. I didn't have any of these previously. (we don't do Taco Bell). I will include a scan in a future Hot off the Scanner Tray post. 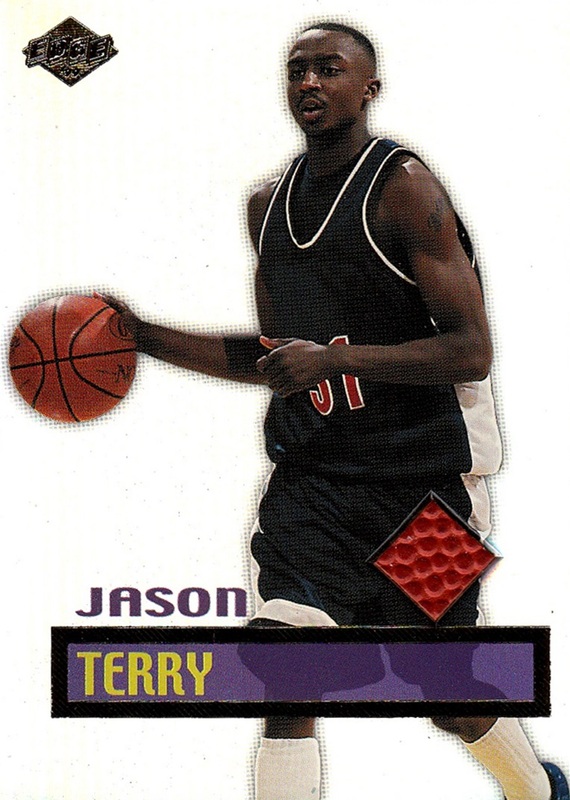 7 of the cards in the trade were from 2006-07 Ultra. I really love Ultra- it was my favorite brand of cards when it was being produced for the NBA- but I had very little from the Upper Deck era, which lasted two seasons, 2006-07 and 2007-08. I have only a blaster's worth from 2006-07 and only about 2 packs worth of 2007-08. Two of the cards I got in this package were ones I got Gold Medallions of back in 2006 when I got said blaster. I think I mentioned this card before, in Gold Medallion form- they did not bother to get his first name right, it's Kris, not Kirk. 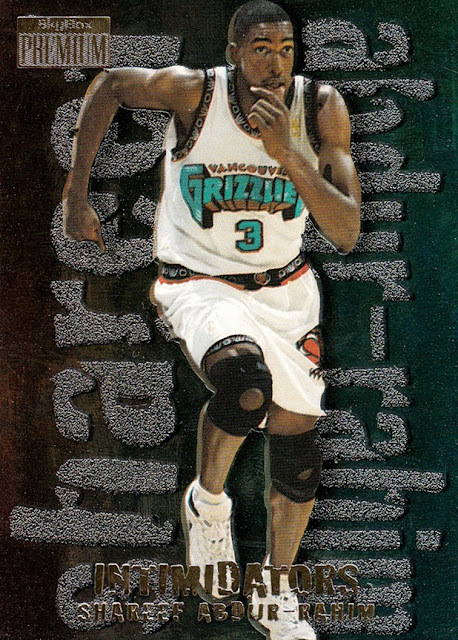 Another card I thought I had, one of the info cards from 1993-94 Stadium Club. I didn't have this one, makes me wonder which other ones I don't have...I thought I had them all. And one last card- I knew this one had eluded me, in this form. This was Karl Malone's first Topps card, and was reprinted during 1996-97 as part of the 50 Greatest Players Rookie Reprint program (he had, by this point, more than a dozen cards extant, but none from Topps, so they reprinted this one- I can't remember if I have the basic version or not, I know I don't have the Chrome or Refractor) I also have the Starting Lineup version of the card, as I got the figure years ago, no idea when. 1990s for sure. That's just some highlights. There were lots more, most of which I have not scanned yet. Thank you trading partners! Just before I put the finishing touches on this post, I made another trade on the Database. It won't get out in the mail until December, though, so perhaps I will make enough trades to make a recap post in December. Thanks for reading! 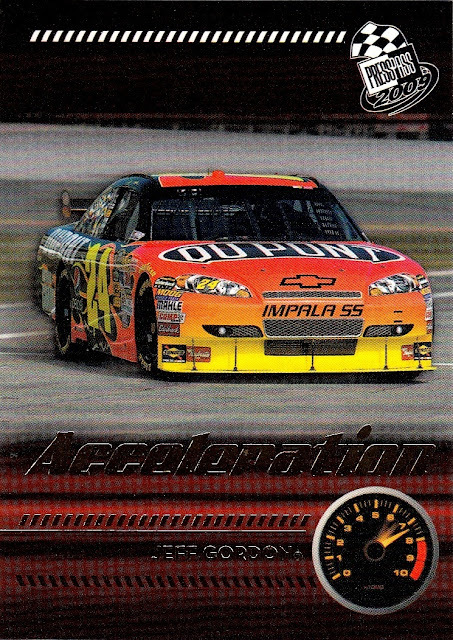 1996-97 Skybox Intimidators #1. 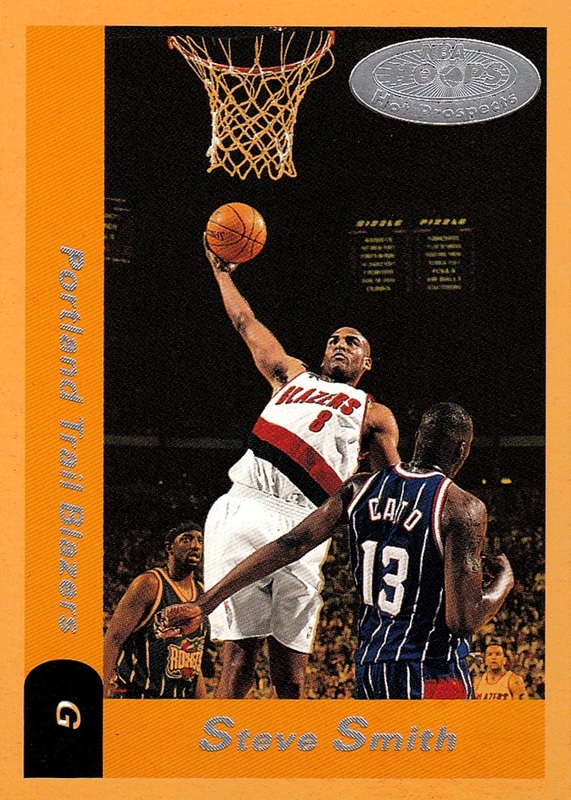 I remember pulling this card when it was new. 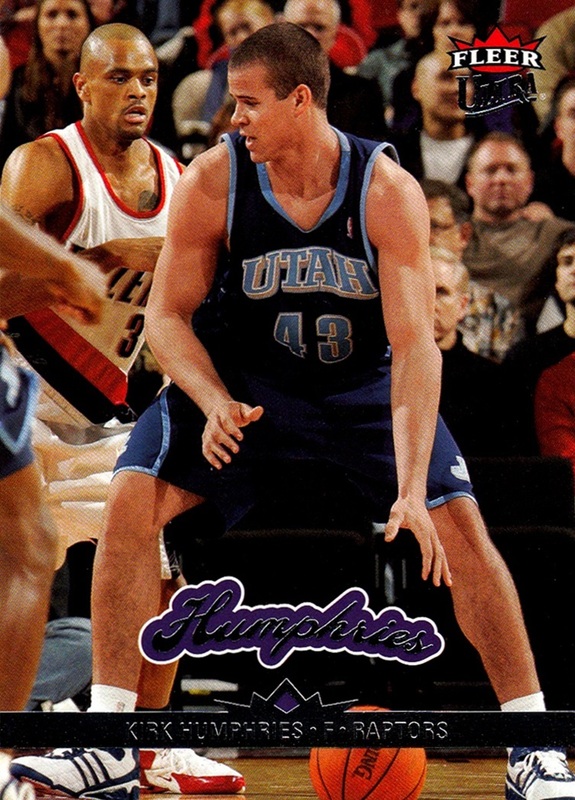 My memory is shot but I think it may have been my first card of him. I've always loved the 1997-98 Ultra Gold Medallions. Great photography on this 2004-05 Ultra card. I don't usually spend time scanning cards that are from sets already done on the Database, I set them aside to do later. 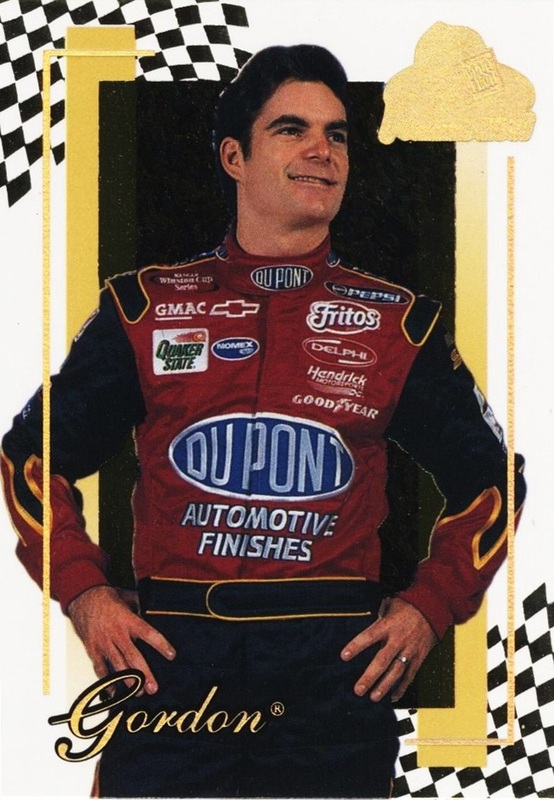 But when I found that my copy of this card didn't have the haze that is usually found on all 1997-98 Bowman's Best cards, I had to scan it. My card came damaged out of the pack, with some creasing, clearly an issue with the paper used in production. I wonder if that had anything to do with it? This is a great card. 1998-99 Ultra World Premieres. 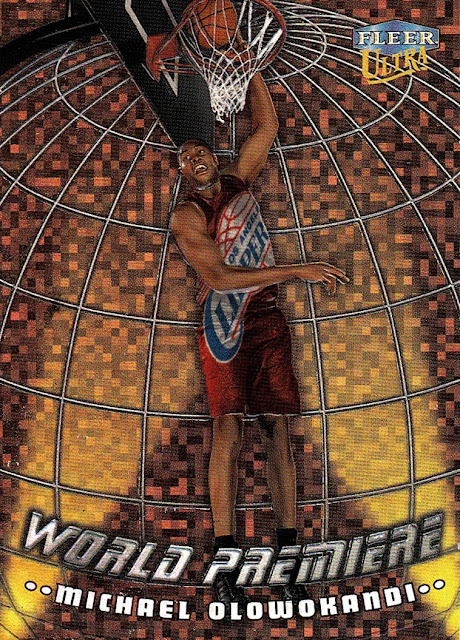 It doesn't show well in the scan but the card is embossed and all holofoil. 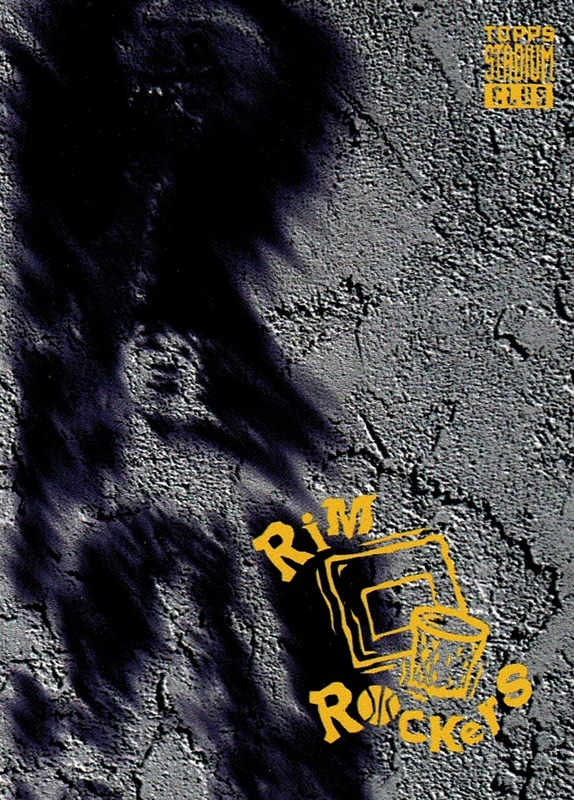 The player, the words and the outlines on the planet shape. Olowokandi was the #1 pick in a draft that included Paul Pierce, Vince Carter, Dirk Nowitzki and others...had that draft happened now things would be very different. Today is a pretty special anniversary for me. 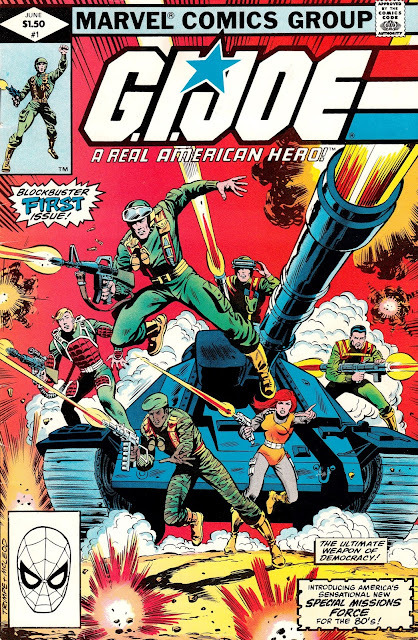 On the day after Thanksgiving, 25 years ago today, my brother introduced me to the world of GI Joe, and it would go on to play a major role in my life. Picture it, if you will....it's 1990, and I am all of 6 years old, having turned 6 just five weeks previously. My brother, who is 13 years older than I, had to go work, his very first job, and I was not happy with this. I wanted to be able to play with him but he had to leave. (My brother has always been my best friend, too) Even by then, putting up the Christmas Tree on the day after Thanksgiving was an annual tradition that I loved- truly, the day after Thanksgiving is always one of my favorite days of the year. 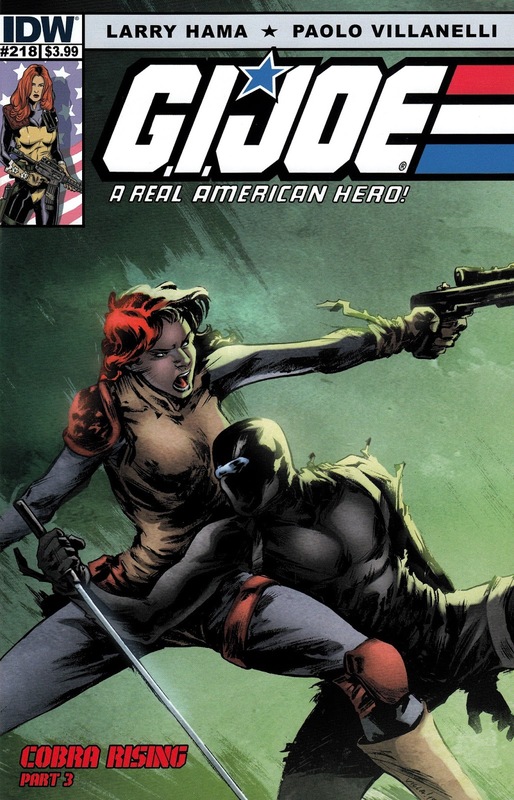 To keep me entertained, he got his GI Joe figures out- and introduced me to them. This was a wondrous experience. Although I had already been a fan of action figures - DC's Super Powers line, Masters of the Universe and Teenage Mutant Ninja Turtles were my previous favorites - I had never seen these. I was hooked, in an instant. 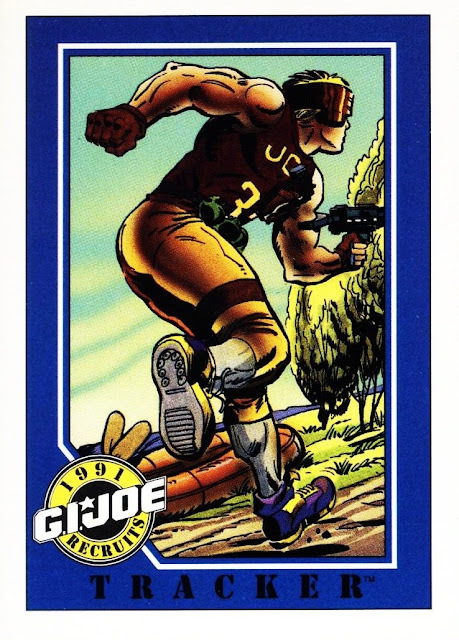 GI Joe has been a part of my life ever since...and in fact, before I discovered NASCAR, it was my favorite thing in the world. Even today, I can still remember some specific events from that day, which is even more meaningful to me because health problems have robbed me of a significant portion of my memory...and these memories also involve my dad, who I don't really have a whole lot of memories of- he worked two jobs up until 5 days before he lost his battle with cancer. I remember my brother didn't have time to teach me the characters names, so we made up our own (By we I mean myself and my dad). At this point in time I can only remember one of the names we came up with- Tattoo for Gung-Ho. I can remember not being strong enough to lift the Headquarters, and following my dad down the stairs as he carried it to our main room. I remember after my brother got home, him sitting on the couch reading the file cards to me while I sat on the floor playing with the figures. (At this point, my dad was putting the Christmas tree together, which was a lengthy process). I remember my brother reading the cards to me after he got home, until mom finished dinner. The memory is so important to me, so ingrained, that I'm pretty sure I even remember what dinner WAS! (I usually do not remember what I had for dinner two or three days later. I can remember Wednesday's dinner but not Tuesdays, just three days ago, or anything before that...lousy health problems). 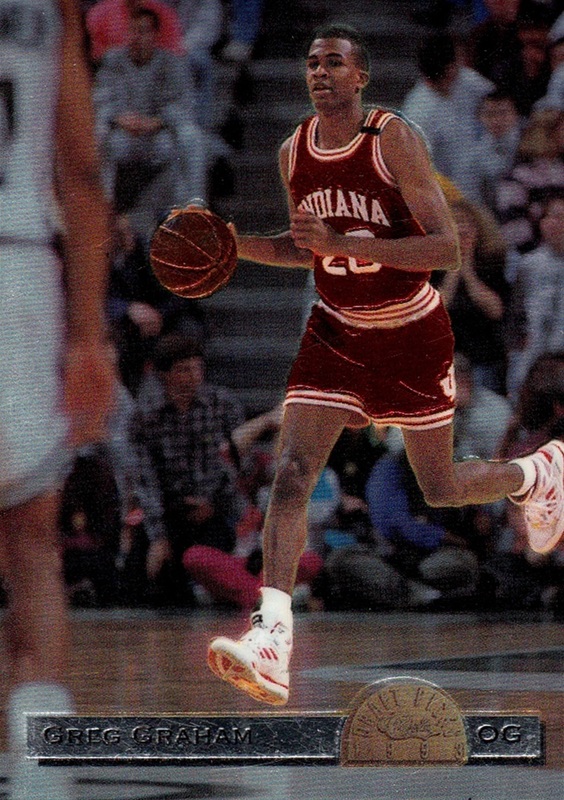 I have this photo labeled as 1991, but it might be 1992. This was likely the extent of my collection at the time, which of course included those my brother gave me. 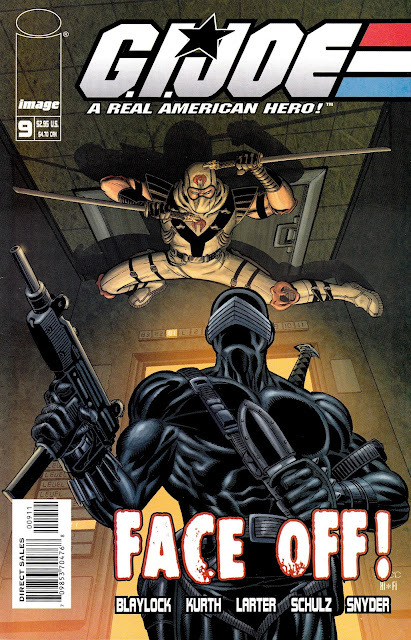 As I've mentioned in the past, I am a lifelong comic reader. My brother read me my first comic at 5 days old, but the first comic I read in a series- not just random issues- was the GI Joe comic. In 2010 (I think), the original comic series was re-started and continued even with the same numbering system. It's still running and I'm still reading it, which is today my only connection to the GI Joe brand. This is the most recent issue. Still written by the same man who has written them since 1982, by the way. You can see why I named Gung-Ho "Tattoo"
I still have them all, safely packed away, where I can pull them out and take a trip down memory lane when I need to. 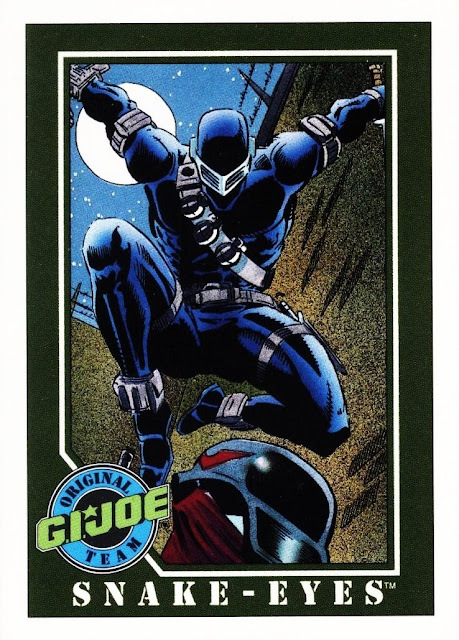 Since this is a card blog, although I have gone off-track to my other hobbies from time to time, there are some GI Joe cards, and in fact I believe the 1991 Impel set was my second completed card set ever, after the 1990 Classic Monster Trucks set. This was a 200 card set that covered most of the characters and even some of the comics. 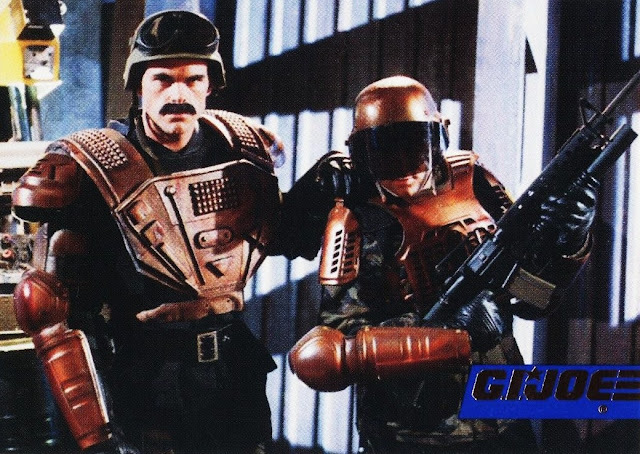 There was a smaller set, from 1993, called Mission: Search & Destroy, that was available in several versions. (With and without foil, and at least one version without text on back- I don't know about that one, or if it was the only one produced that way), These were live-action photos of current year action figures. I still have a sealed copy of comic #135 with a card in it. There is also a card set from 1986 or 1987 (I'm not totally sure which) that uses the drawing that was on each action figure's packaging. I'd like to get those for my collection at some point as well. I have none as of right now. There was a set issued in 1994 for the GI Joe brand's 30th anniversary, but I believe that was for the 12 inch dolls of the 1960s only; I have only one card from the set, not sure where I got it. So, there you have it. 25 years is a long time to be involved in a hobby- and while it's no longer the huge part of my life it once was, I would not be the person I am today without it, and although I have not purchased an action figure, or card for that matter, in more than a decade...(21 years for a card)...I still consider myself a GI Joe fan...and I expect I always will. Rainbow collecting is popular these days, which multi-color parallels of varying rarity being the current trend. I'm not really doing much of that- sure, I'd love to if I had the money- but base cards remain my focus. I'm not sure if three cards counts as a rainbow, but this is one of only three times I'm aware of where I have all versions of a card with more than one parallel. The Tiffany card- on the far right- is actually a hard one to find. They were not serially numbered, but they were 1 per box. With a 200 card series 1, finding each card is a challenge. In fact, I only have two...from the entire set (Series 1 and 2). This is the only one I got new. I didn't remember having the Crystal version, in the middle, but I did. This series of scans also shows well how the finish on the base cards scans differently than the normal glossy coating- all three images were pulled from the same scan. It may be difficult to tell, especially in the smaller presentation form that the collage makes, but the base card has gold foil, the Crystal in the middle has silver, and the Tiffany has blue holofoil. I pulled all three versions of the 1997-98 Bowman's Best checklist from packs. 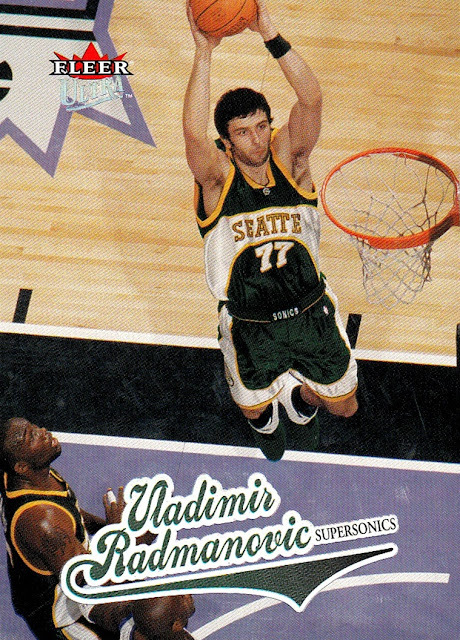 I assume I did for the Vrankovic as well, but since I don't remember getting the Crystal version, I can't be sure. With how much I love Refractors, I'm truly surprised I don't have the full rainbow of any others. 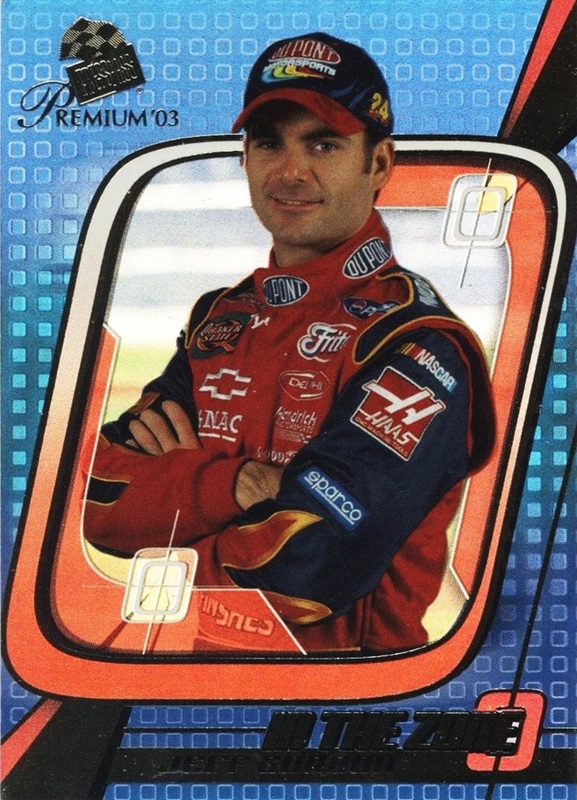 There are a couple from 2002-03 Topps Chrome that I am one away from, though. I've said it before, but it bears repeating- I LOVE checklists, and I miss them being made.The Atomic Refractor does not scan as nice as it is in person- none of the Finest/Chrome/Bowman's Best cards really do. 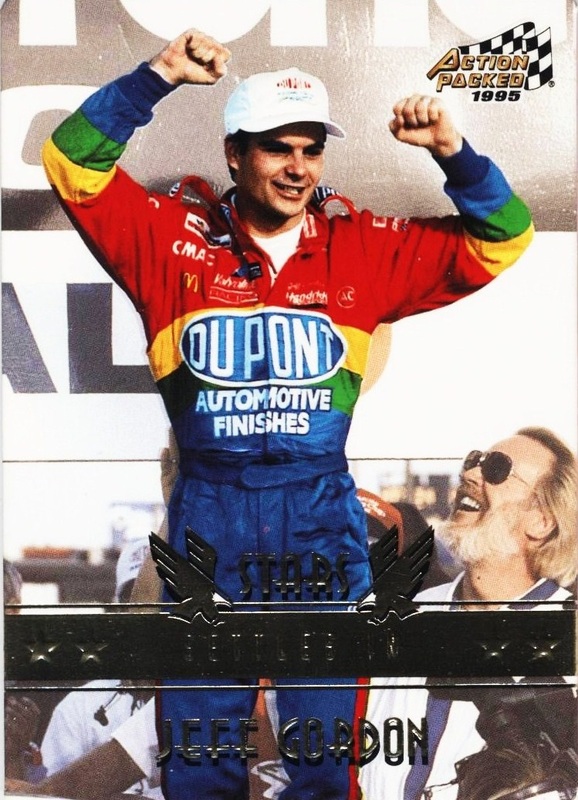 This is also the only rainbow I've completed with serially numbered parallels. The base card is unnumbered, the Club Box to 250, the Balcony to 100, and the Standing Room Only to 25. 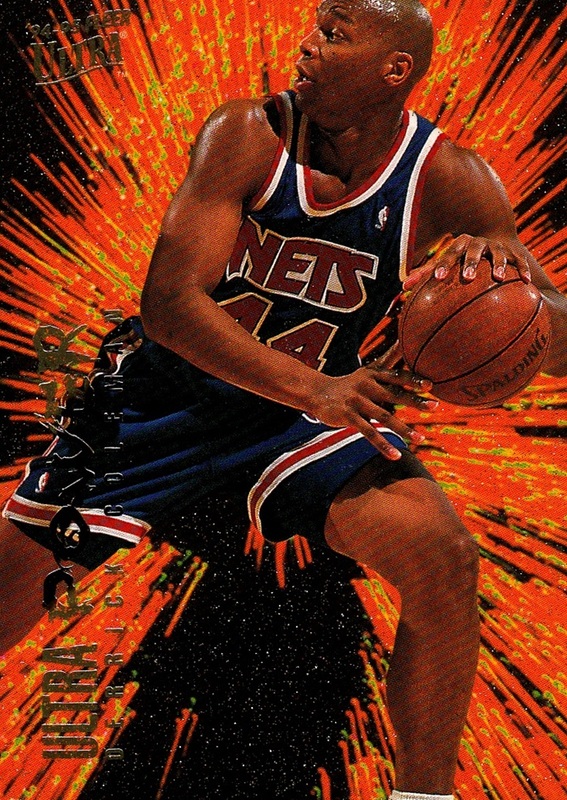 I really liked all 4 years of Fleer Authentix when it was new, but as time has gone I don't really consider it as great as I once did; as I've matured (? ), I've realized how much more I value an actual photo, not some digitally created thing like these were. I'm still thrilled to have as many of them as I do, of course, but they don't rank as some of my all-time favorite sets anymore, as they once did. And that's it. Of all the thousands of cards produced for both the NBA and NASCAR, these are the only three where more than two versions were made and I have them all. Some of the rainbow stuff is getting a little out of hand- for instance, in the 2014-15 Select set, there were 37 parallels. Yes, that's not a typo. Three. Seven. Completing a rainbow would be near impossible, especially as it includes at least three cards numbered to 10 or less, including at least 1 1 of 1. By the way, the thread title is indeed a nod to Skittles...AKA, my Kryptonite. I used to "taste the rainbow" a little too often...one or more large bag a week...which is why my blood sugar was over 1000 when I collapsed and came literally 5 minutes short of dying in 2013. (The desired blood sugar number is 80-120; the ambulance couldn't even read how high my number was). Also, tomorrow is Thanksgiving, thank you readers, and even bigger thank you to commenters, as I make my 100th post of 2015. The next to last installment of the Useful Birds of America series (in my collection, anyway) is the next set in my collection chronologically. This one features the same design as all the others, and I suspect possibly some of the artwork was reused as well, as some of them in this series have a 1915 copyright date. 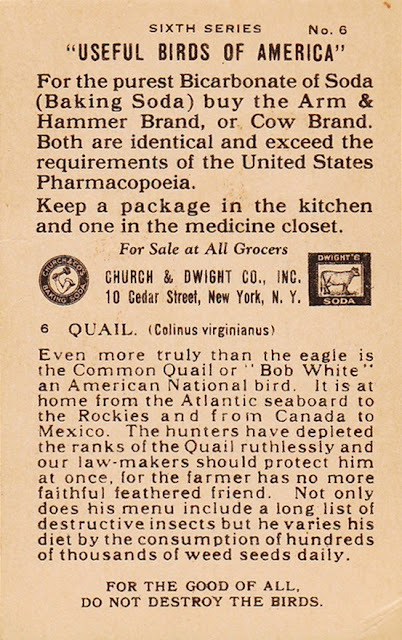 It is my first set from the 1930s, which is the decade that really saw trading cards move from from being inserted with cigarettes to being inserted with candy; it is also when they moved from being marketed to adult connoisseurs to kids, something the hobby still hasn't truly shaken. I have 9 of the 15 cards from this set, or 60%. Not bad for a set that's 82 years old! Most of my cards from this series are actually in pretty good condition, luckily. 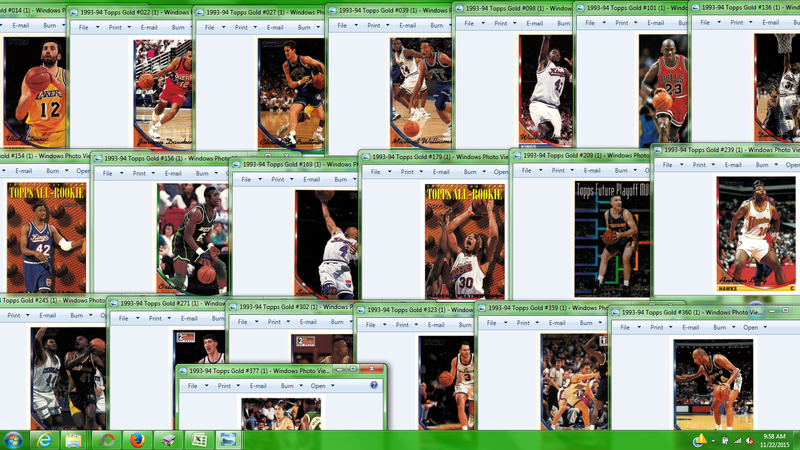 You can see the full checklist, and front and back scans of all my cards, on the Trading Card Database. But...it isn't my only one. I forgot I had these two! Although since they are totally unlicensed they are technically bootlegs rather than college cards, I count them as part of my NCAA collection- not NBA. The backgrounds are holofoil, not white, by the way. 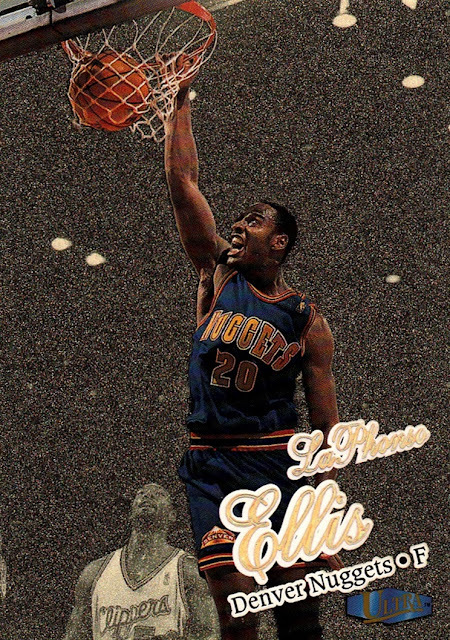 Sometimes the yellow foil from 2000-01 Hoops Hot Prospects scans terribly, nearly brown, sometimes it scans really well and looks like it's glowing, that is the case with this one. I had to do a page of Chrome cards and I had my only two from this set handy, so I did them. The 1993 Classic set is one of the few college sets I actually like, and I have completed. These two I got in a mixed lot sometime in the mid-1990s- I don't know when exactly but 1996 is likely, I can't remember not having them. It's even possible that I didn't get them from a mixed lot and traded for them with one of my friends from school. I simply don't remember anymore. Figures that the college chrome card scans better than the pro one does, hah! 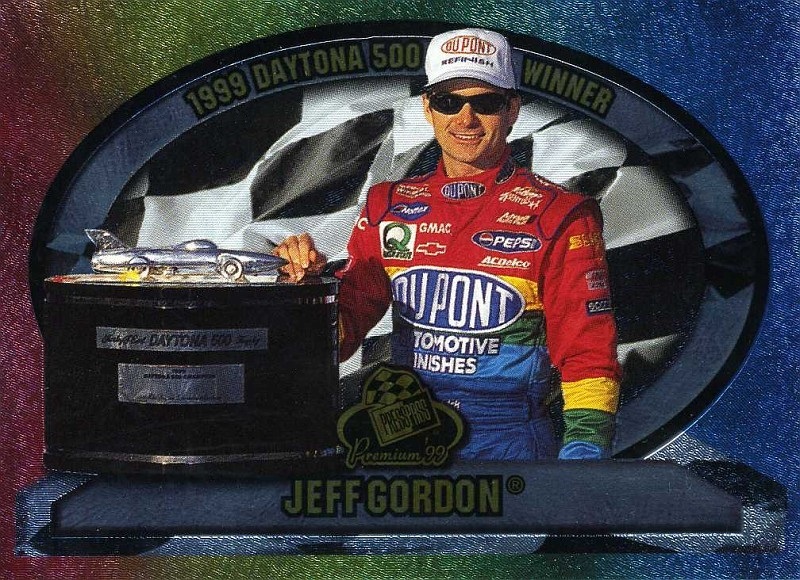 This was such a great 1990s insert. The scan does not capture the gold sparkles on the card. All those "spots" in the black field are sparkles. Working on 1993-94 Topps. Since all the base set was posted to the Database, I pulled them out and set them aside for scanning after everything else is done (along with other sets already done on the Database). I left the Gold parallels mixed in. Since the backs were the exact same, I decided to do the fronts only of the base cards. So I don't end up scanning something already done, I decided to go in and pull the base and scan them as I do the golds. As I found the base cards in the stack of over 350 cards, I closed each of the windows I had open, until I found them all...as it turns out, the Lloyd Daniels base card was not in there. I'll find it someday. Luckily, I hadn't come across all that many Golds yet, and was able to fit them- barely- onto one screen. Also, no picture with this one, but I am well prepared for future posts in my Sets in My Collection project. The last one I posted was #9, on Halloween. I decided to build up a bunch of posts in queue, and I now have post up to #34 written and ready to go. I will probably post one on Monday or Tuesday, and another later in the week. I want to do about 2 per week. I could, in theory, post one a day every day when I don't have something else to post, like the weekend HOST or whathaveyou, but I don't think I'm going to do that. Jeff came into the sport when NASCAR cards were just hitting their stride, and as such, he has more cards issued than any other person in the sport's history. He also has the most cards in my collection. 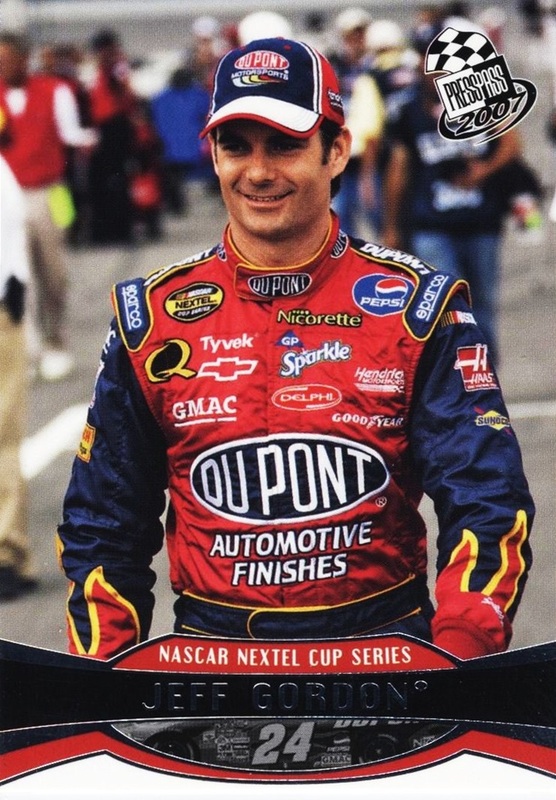 Not just my NASCAR collection, overall, which is quite a feat as my NBA collection outweighs my NASCAR collection by more than 50,000 cards. 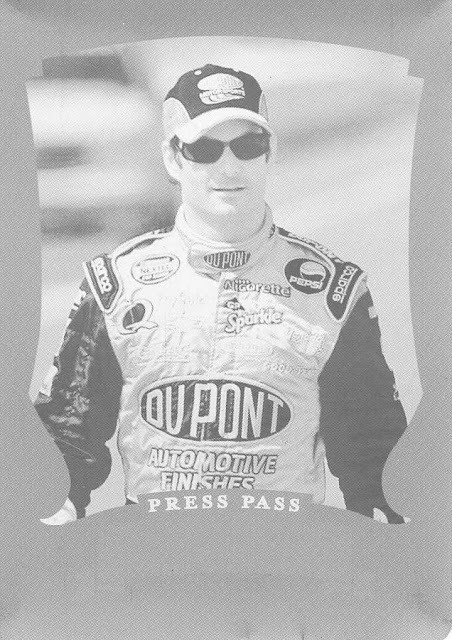 Part of that speaks to the way Press Pass did things for many years- a 50 card set would usually have 5 or more cards of Jeff in it- I think 2002 Eclipse had 10 cards of Jeff in a 50 card set. 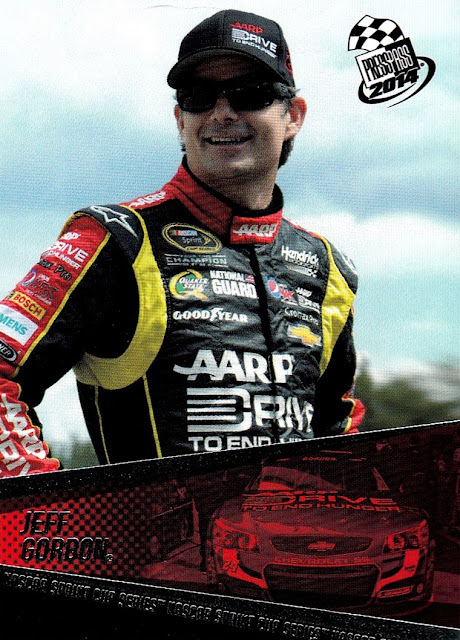 While they blundered through their exclusive license with NASCAR between 2001-2015 it padded Jeff's card numbers (and a few others they chose to favor) which greatly contributes to that. 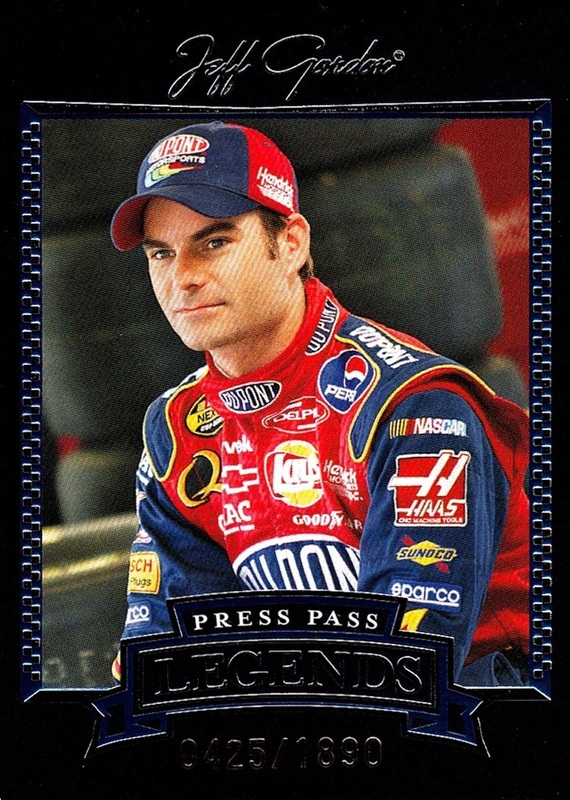 Even so, he holds position #1, and probably will for a long time, with NASCAR cards temporarily dormant and 8 of the top 10 players in my NBA collection retired, the two still active trail Jeff by several hundred cards, and it's fully expected that one is going to retire at the conclusion of the 2015-16 season. 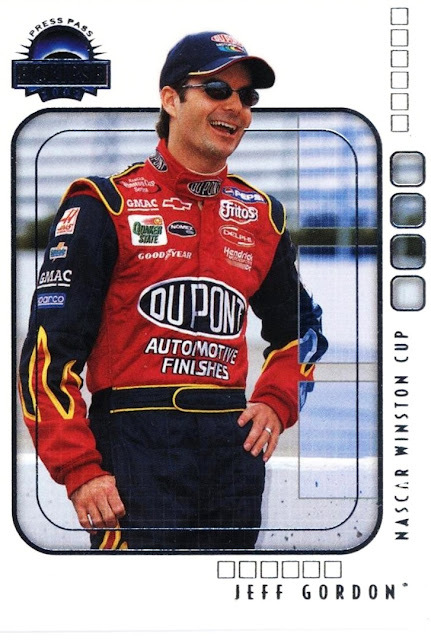 My records show 969 cards of Jeff in my collection, but the numbers aren't totally accurate, as I've gotten some more that I have not typed into my Excel chart yet (I'm months behind), and that also does not include the cards issued with diecast cars (I count them as a separate collection) and that also doesn't count cards he shares with other people. And, of course, there is also the high probability that I've miscounted over the years. 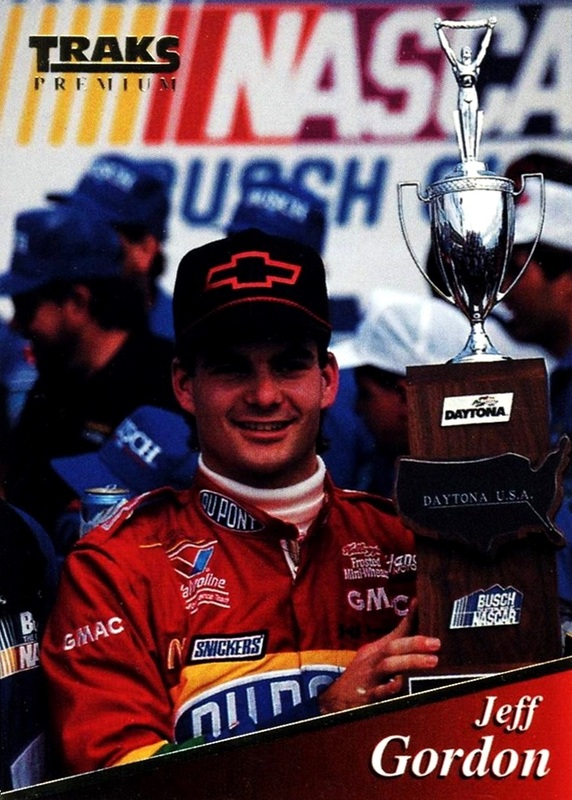 As of this writing, Jeff has won 93 Cup races (3rd all-time), 4 Championships (4th all-time), 81 poles (3rd all-time), 797 career races (9th all-time, they were all consecutive, 1st all-time. Jeff has never missed a race!) He's led 24,920 laps, and finished on the lead lap an impressive 580 times. 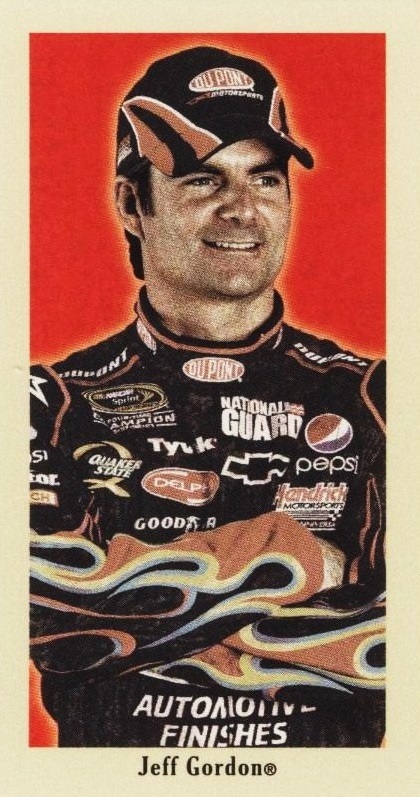 He's also earned over 150 million dollars, not even counting endorsement deals (1st all-time). He is also tied for most wins in a season in the modern era- 13. 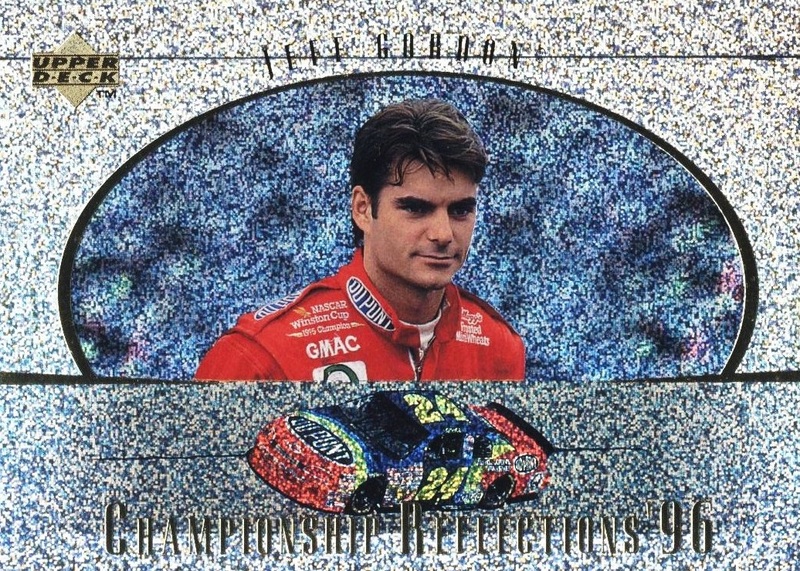 He won double digit races three consecutive seasons, which in the modern era is almost impossible to do in any season by any driver- you can count all 10 or more win seasons in the modern era on your fingers...from all drivers combined. Jeff also won races at all but one of the tracks he raced on, the only one he did not win at was only added to the schedule in 2011. Jeff has one race left to go, and he's still very much in contention for the 2015 title. With the current points system, whichever of the 4 drivers still eligible that finishes higher at the Ford 400 at Homestead is the Champion, and Jeff is one of those 4...and one of only two of those drivers who have won at the track before. 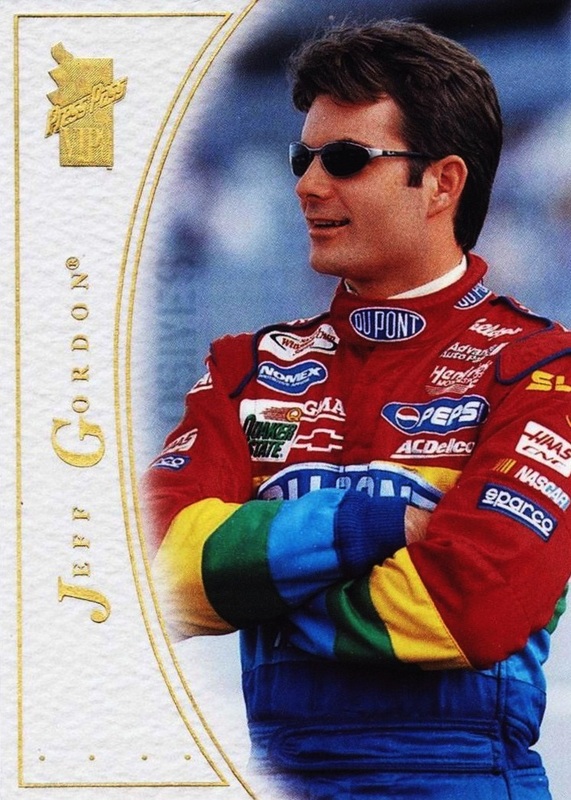 And now...please enjoy a gallery of one card from every year of Jeff's Cup career! Jeff Gordon has driven his entire Cup career for Hendrick Motorsports in the #24 Chevrolet, one of the longest driver-team-sponsor combinations in history. 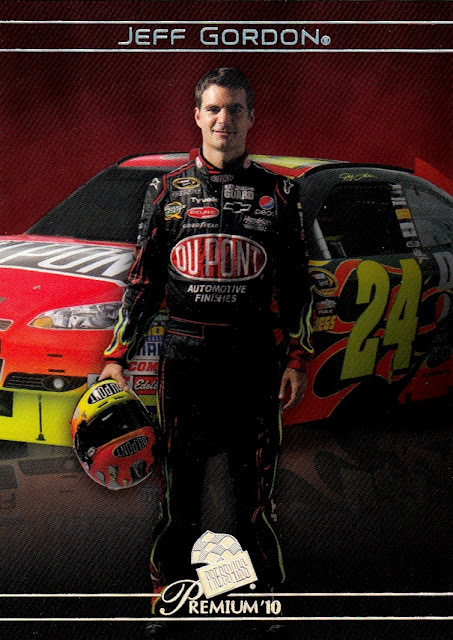 DuPont Automotive Finishes began sponsoring him for his first race, and remained his primary sponsor until the conclusion of 2010. 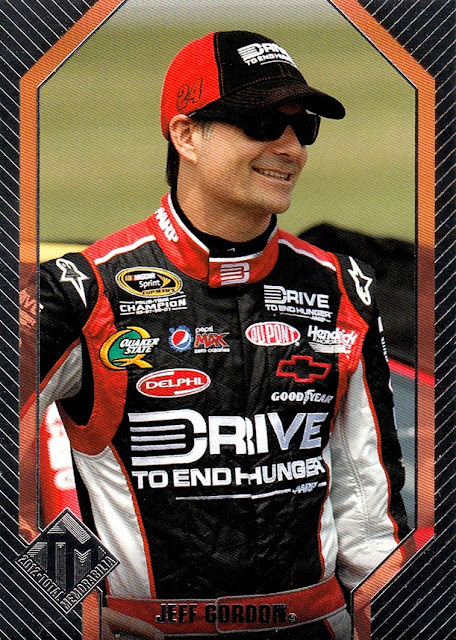 AARP's Drive to End Hunger has been the primary sponsor since then, with DuPont remaining as a part time sponsor. 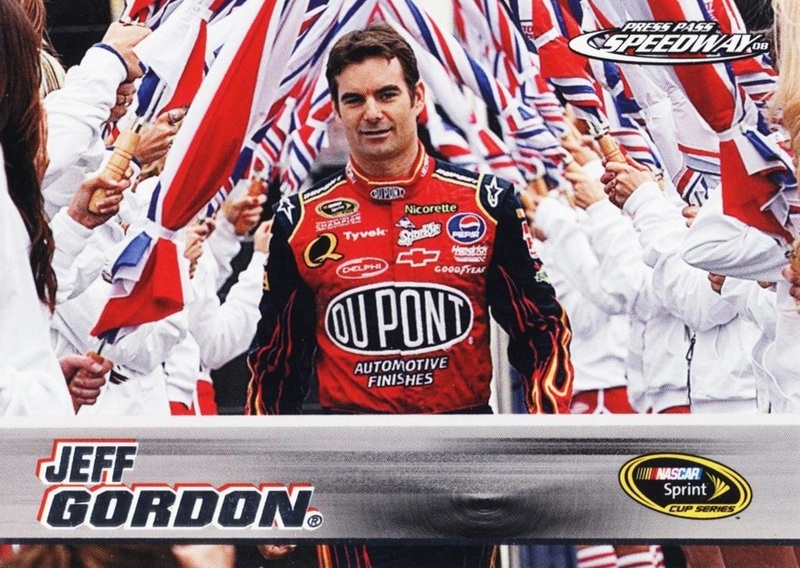 Recently, DuPont was sold and renamed Axalta. For 2015 3M also became a major sponsor. 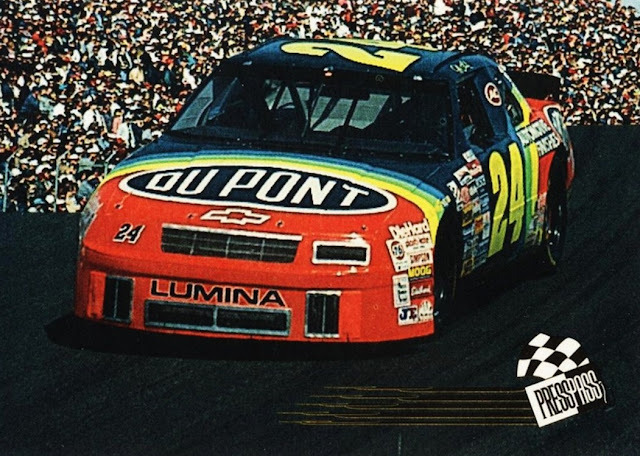 Pepsi has been a major associate sponsor and the main sponsor for one or two races a year (at least) since 2001. 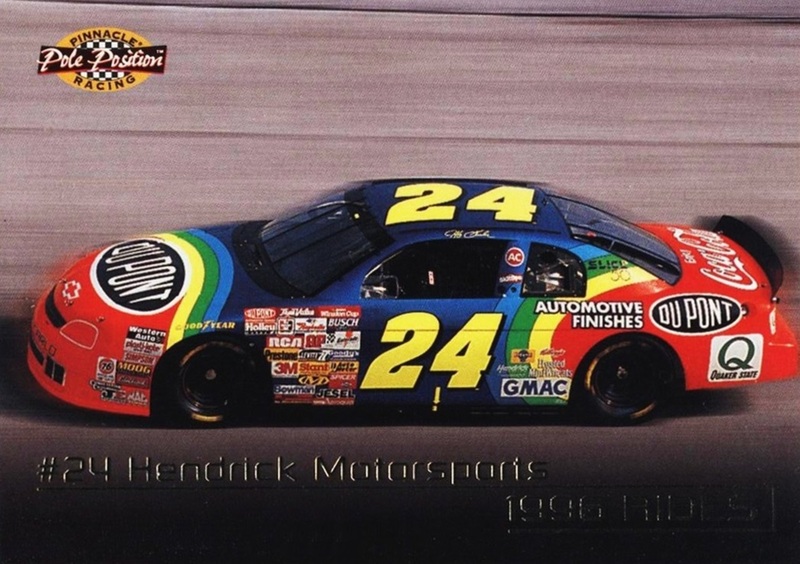 The original rainbow paint scheme is the iconic Jeff Gordon scheme. It was used from the final race of 1992 (his first race) through 2000. 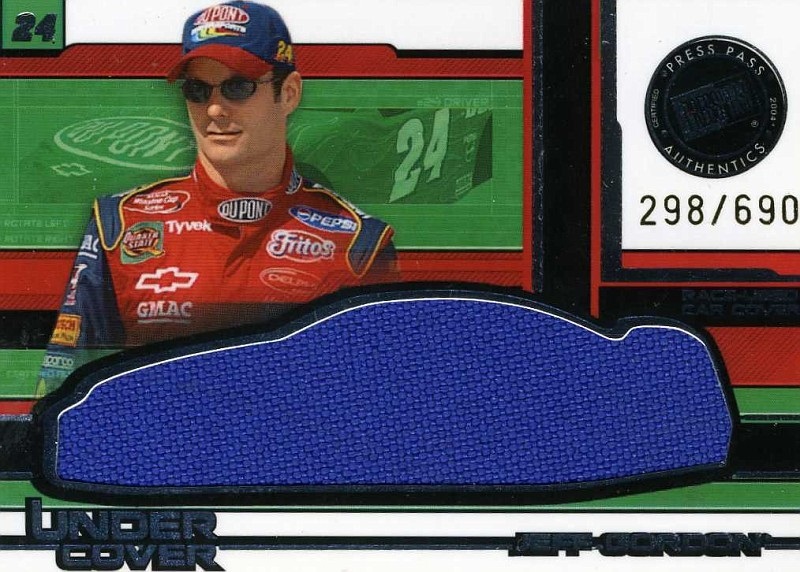 The blue flame scheme debuted in 2001, and was the primary scheme for 2001-2008. 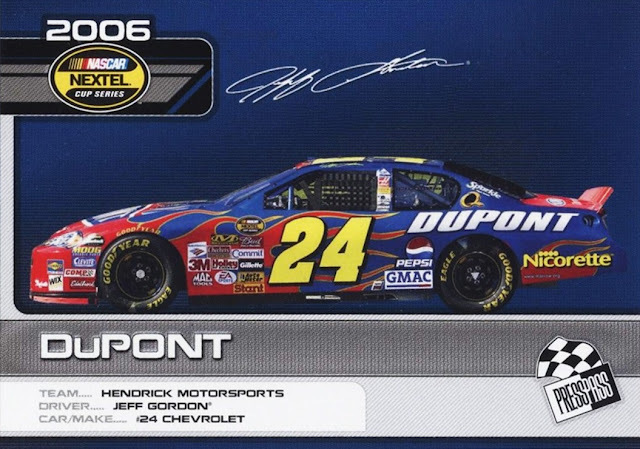 The black flame scheme debuted in 2009 and has remained the DuPont scheme (with less flame colors) until this year. 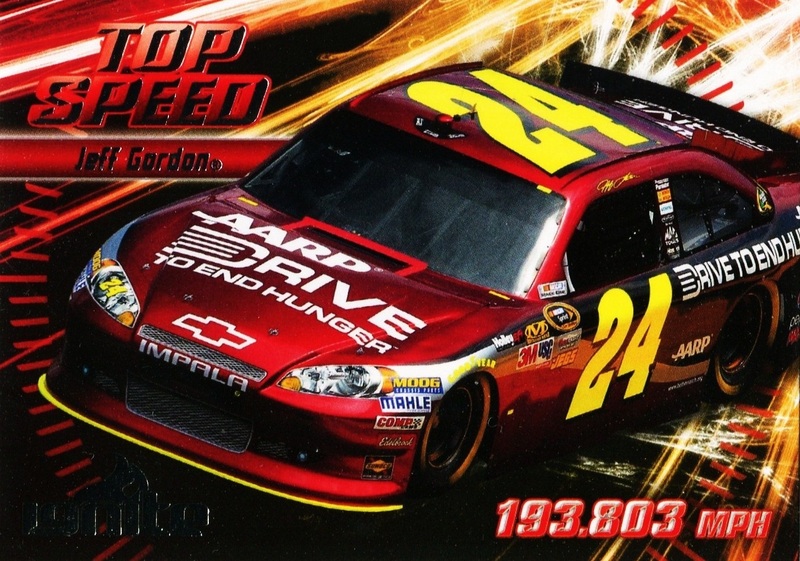 AARP's Drive to End Hunger scheme has changed every single year it has been on the car. 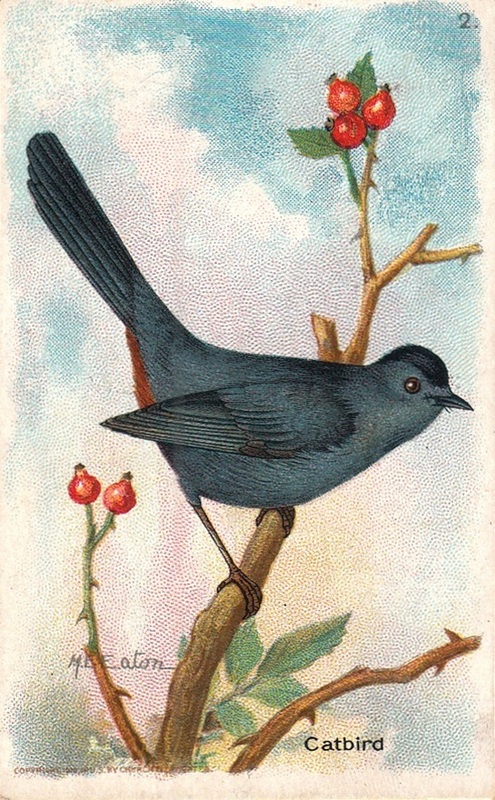 Not every year has appeared on cards. 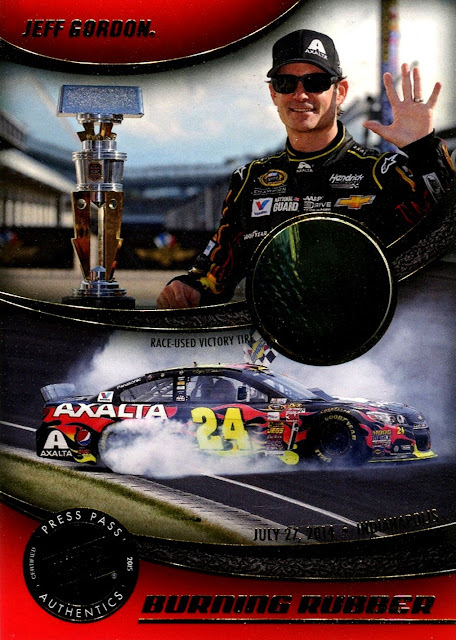 The only card I have that shows the Axalta paint scheme is the Burning Rubber insert from this year's Press Pass. 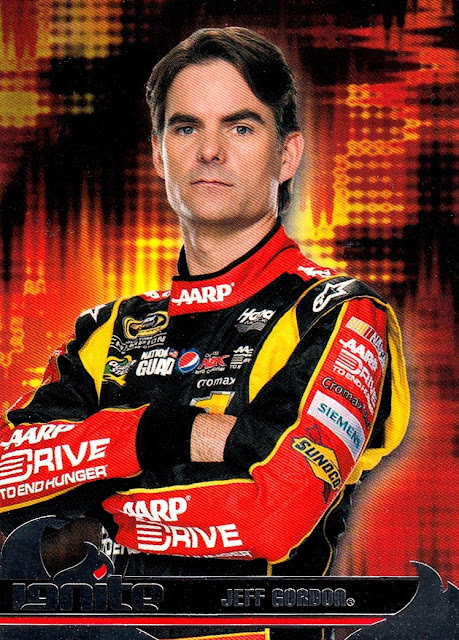 I do not want Jeff to retire, I want him to keep racing, but I understand why he is. 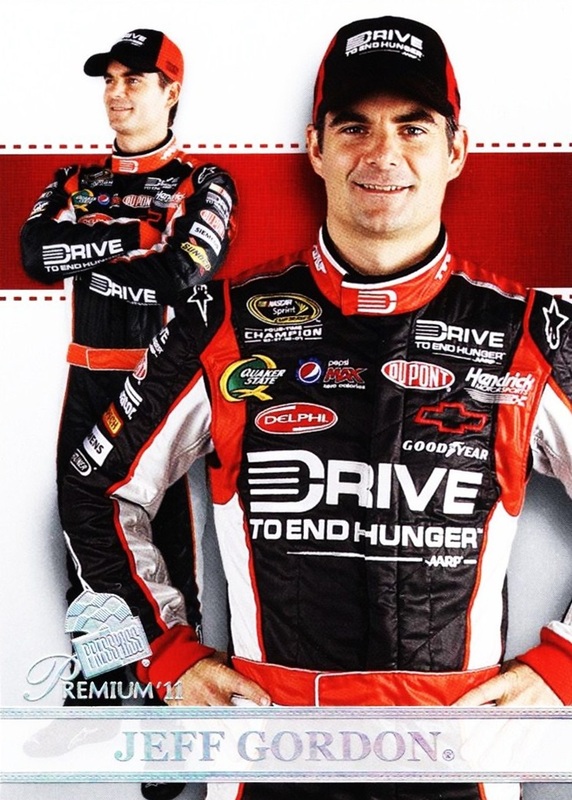 NASCAR isn't going to be as fun without the opportunity to watch him race. 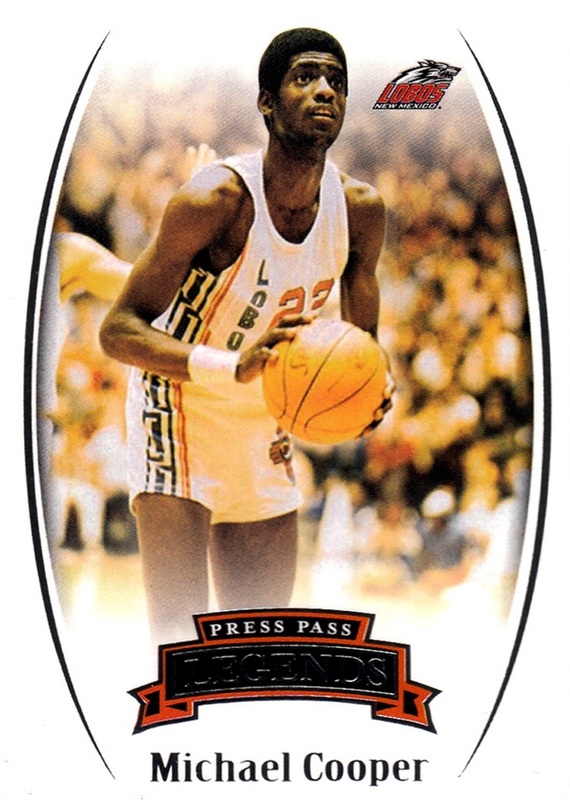 He won't be totally out of sight though, as he joins the Fox broadcasts as an announcer. And of course, he still has one race and a VERY good chance to win another championship tomorrow! If he does that, he'll still be setting records in his last race. 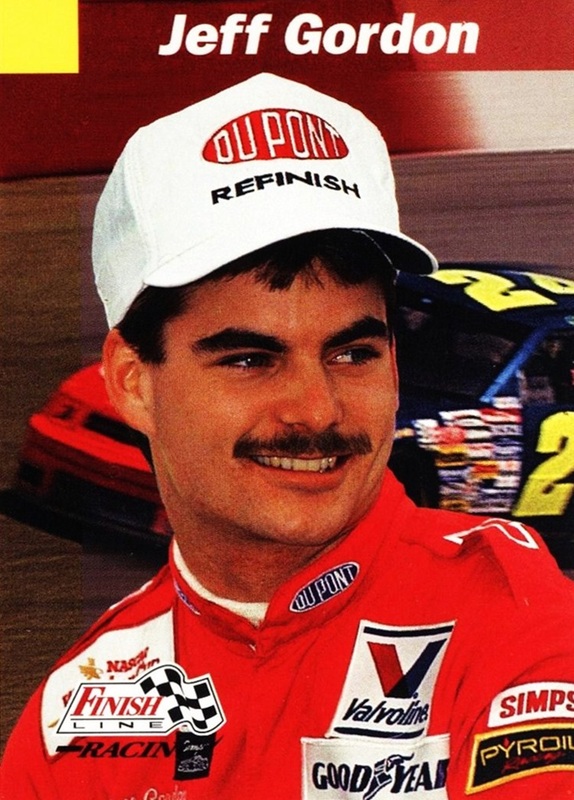 The current margin of time between Cup titles is 12 years, set by Terry Labonte, who won in 1984 and 1996. 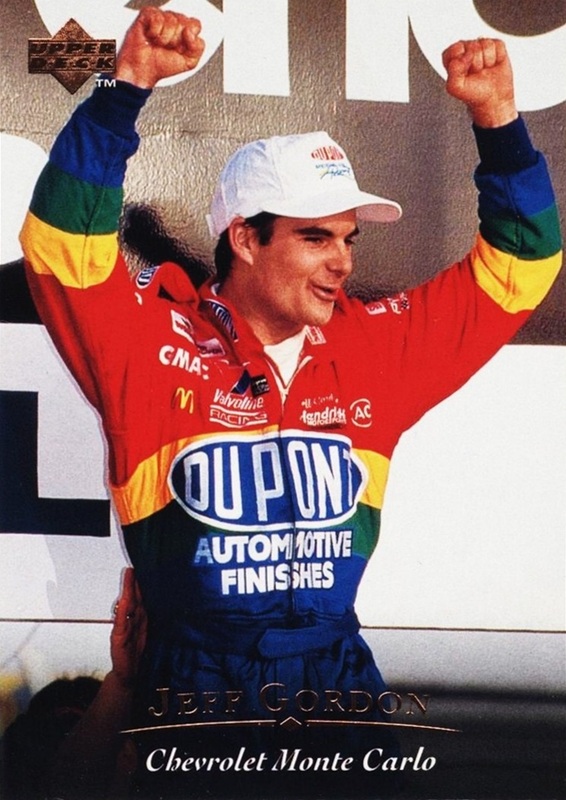 If Jeff wins tomorrow, the new record will be 14 years, as Jeff's most recent Championship was 2001. Good luck Jeff, and thanks for the memories!